Seven friends go on a camping trip in Canada. They decide to explore a cave, and after a strange light sweeps through the interior, they emerge from the cave in another time. They've traveled from the 21st century to the 18th century. They are alone in the wilderness and must work together to find their way in this new, old world. 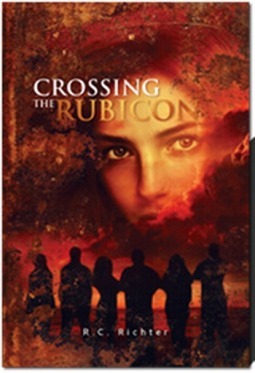 Crossing the Rubicon by R.C. Richter is a fascinating story of modern-day teens trying to make it in colonial times. They head west to escape the coming winter, and end up traveling across many locations throughout America and beyond. While this is a fantasy/time travel novel, there are many aspects of historical fiction as well. Richter brings us into this primitive world, showing us the people and cultural norms of the time. The story is told from the perspective of Trinity in the form of a journal. One of the issues I had with this format is that, while written as a journal with dates at the beginning of each entry, it isn't really written in a journal style. Trinity writes her story as if she's telling it many years later, rather than at the end of each day. There's a lot of foreshadowing of things to come, which takes away from the suspense of the story. There were many rather far-fetched situations throughout Crossing the Rubicon, but this is a time travel novel, which makes it far-fetched to begin with. I did like the way Richter incorporated the modern-day items the teens had with them, and the way he tied things up at the end. I also enjoyed reading about the different locations they traveled through, and the cultures they encountered. I think if he had shown more of the story, rather than telling it, and if the characters had shown a bit more emotion, I would have rated it much higher. It's definitely a worthwhile read, though, if you enjoy time travel and/or historical fiction. This review was written based on a copy of Crossing the Rubicon that I received from the author in exchange for an honest review. The storyline is really interesting! I really love time travel stories. This one sounds intriguing - I hadn't heard of it before. Thanks for the review!